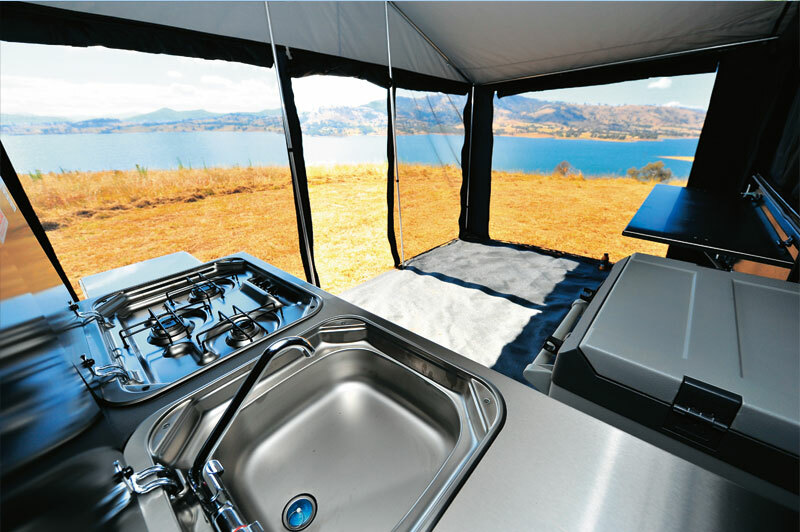 In the last five years or so, there has been a slow revolution in camper trailer design and fit-out. In the mid-2000s a top-of-the-range soft floor camper trailer might have set you back $20k. Now, you can spend nearly $50k on a fully loaded family camper, with a lot more sausage thrown in for your money, and companies like Mountain Trail are at the forefront of this quality revolution. 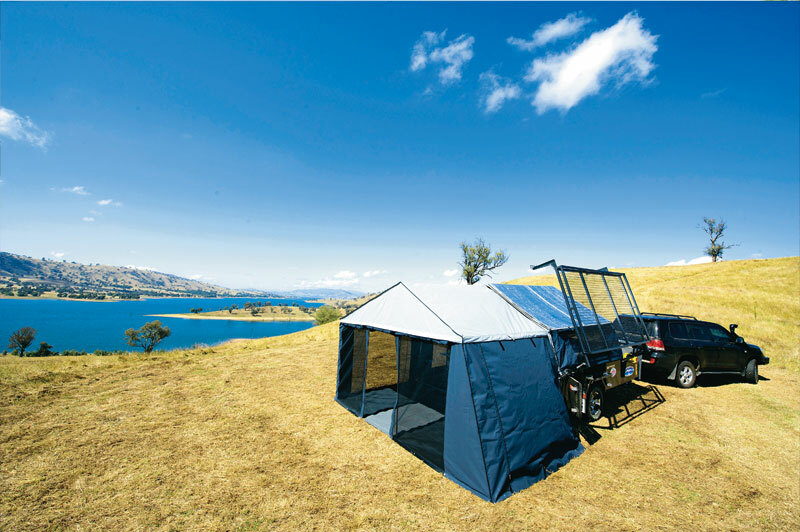 While the other end of the market competes to import the cheapest trailers from China, Nick Edwards at Mountain Trail has gone in the other direction, concentrating on building his trailers with the finest materials available, with an attention to little details that reflects the philosophy of European touring automobile manufacturers. 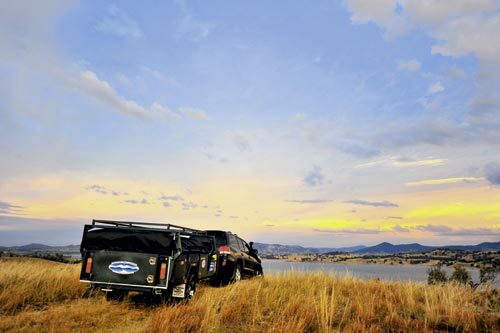 The 2012 Expedition captures this spirit. 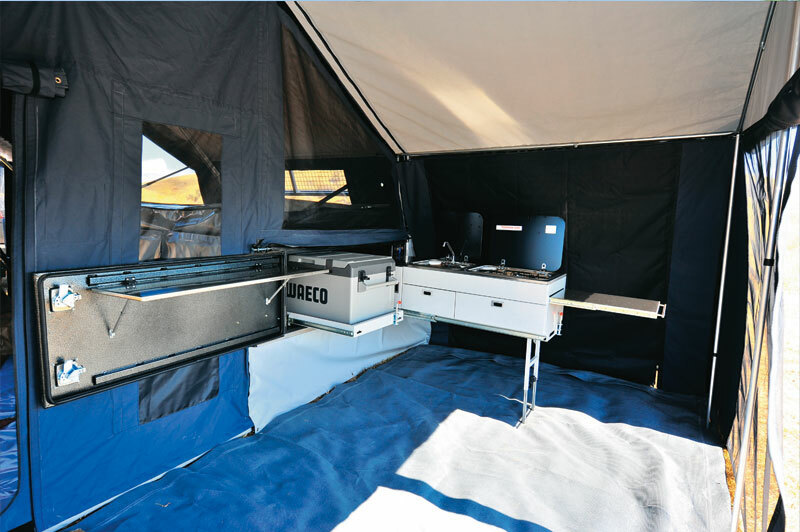 Every camper trailer has a kitchen, but the combination of laser cut powder-coated steel, stainless bench tops with soft-close latchless drawers and pull-out benches on this kitchen raises the Expedition to a level heretofore unseen in the camper trailer world. Quick connect gas and water help to make it more convenient, and with the 80L Waeco fridge and pantry right at hand, it is a well-designed system with heaps of bench space. 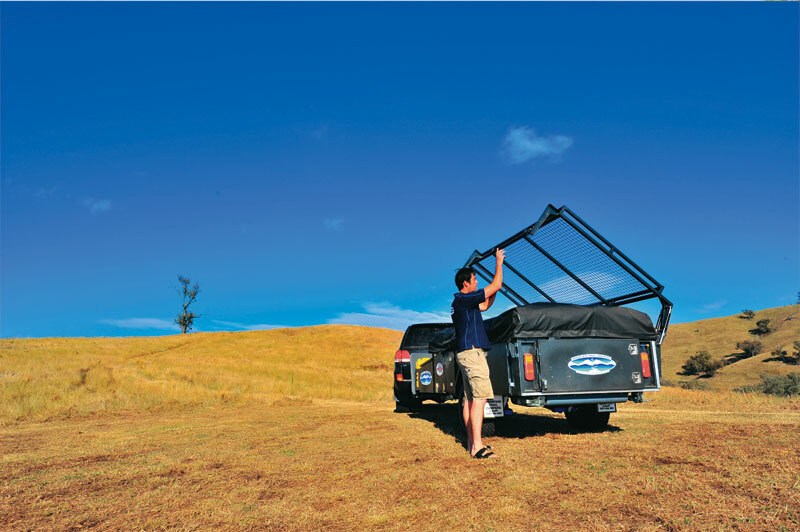 A unique feature of Mountain Trail's range is the tailgate, which opens 180° and houses a handy pop-up bench for even more prep space where you need it. 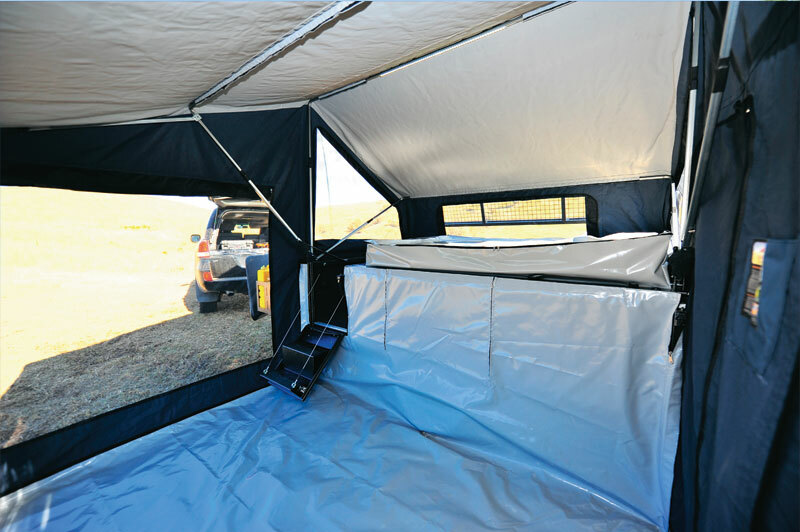 And the classy style of the Expedition does not preclude function, this trailer is attentive to the needs of real campers. Anyone who has spent any time travelling in the bush knows that to survive with any flair requires a place for everything. 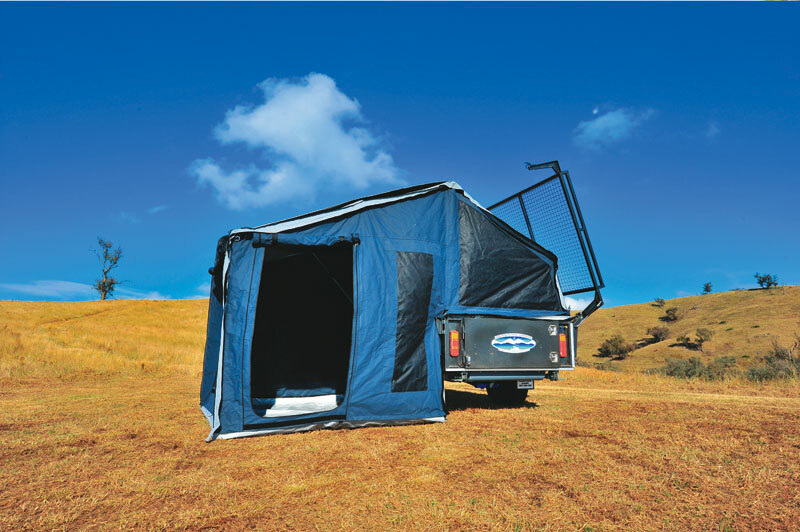 The Expedition has a staggering 23 separate storage areas spread around the camper, from the six enclosed lockers around the camper to the Drifta wardrobe at the foot of the bed and a huge pantry next to the kitchen, everything stays where you put it, and you can kiss those old plastic tubs goodbye. LED lighting is inconspicuously integrated throughout the camper, so you're never left in the dark. 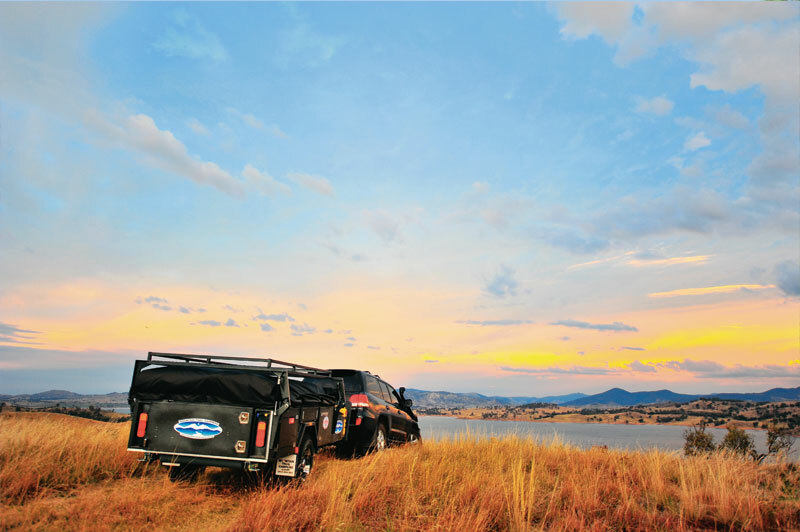 The Expedition is good for weekends away because you can leave it packed with everything you need for a quick escape, but it is really built for people looking to live in it for extended periods. From the ground up, no expense is spared. Our review model had the optional Vehicle Components independent trailing arm suspension system with 12in electric brakes on 16in rims with All Terrain tyres. A Vehicle Components DO35 coupling is used, with the included hand brake. The trailer itself consists of 100x50x3mm zincanneal which is powder-coated. The trailer body is sandblasted after welding, then zinc coated and powdercoated. The front toolbox is fully welded to the trailer body, as is the huge stone guard in the front, so the trailer is essentially a single monocoque structure, with no vibration anywhere. Walking through the factory you can see how carefully these trailers are put together, all of the important welds are fully done and clean. 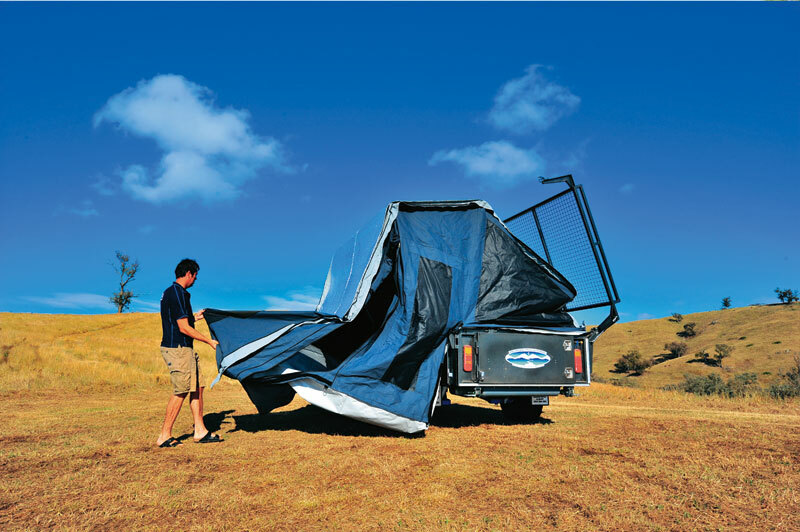 Even the soft cover for the tent uses tonneau material, which stretches and breathes, rather than the ubiquitous PVC. Behind the stoneguard are two jerry can holders, a full size spare, an outboard motor mount and the huge toolbox, which has dividers inside. Some tents just sit well, and without being a sailmaker, that's about the best compliment I can give the canvas work on the Expedition. Nick set up the whole thing including the awning in about ten minutes, and it is easy to see his canvas maker knows what he is doing. A good combination of inner and outer window flaps means you get external awnings on the big windows, but internal flaps that are easy to open and close without dealing with the weather, too. Lastly, the electrics on the Expedition are some of the best in the industry. Twin 100Ah Century deep cycle batteries power the system, which includes a Projecta smart charger, DC-DC charger, Victron meter, solar regulator, water level indicator for the 130L onboard tank and a fuse board with fuses for every circuit. Everything is slickly mounted on stainless steel fascia and the wiring is clean and professional. At 1100kg empty (with an ATM of 1750kg), the Expedition manages to combine honest building with a manageable touring weight and capacity. Our Expedition, with the optional suspension ($2,250), extra annex walls ($1,200) and swing-over storage rack perfect for all of your toys ($2,800) was $41,200. The fit and finish on the entire range of Mountain Trail campers may push the price up a bit, but I like living in a world where there are nice things. I may not be able to afford one today, but is that all that counts? This is the camper that dreams are made of, something beautiful to aspire to. We've fought wars against fascist regimes over this kind of thing, so we should stick to our guns when it comes to our own lives.